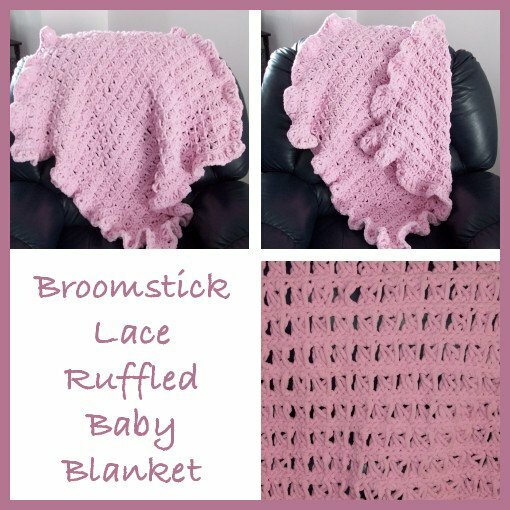 Worked in a simple pattern, this broomstick crochet baby blanket features a nice ruffled edge. It’s perfect for both baby boys and girls, and is super cozy due to the thick yarn that is used. This is a fun ruffled baby blanket to crochet up. It is a mindless pattern that you can do while socializing or relaxing. The blanket can be crocheted up in a day or less, depending on how fast you crochet, or how much time you have. Instructions are given to make a square baby blanket, but you can make it into a rectangular blanket by doing more repeats of the pattern rows. Just remember that when you do your edging that you end up with a multiple of 3 sc sts, and that the stitches are evenly worked around the edge. The great thing about broomstick lace is that you do not have to turn you work, and both sides come out looking great. For a tutorial on how to do the broomstick lace st, click here. Here is another baby blanket crochet pattern that you might enjoy. Or, to stick with broomstick, you might enjoy this popcorn broomstick afghan, which could easily be modified into a baby blanket as well. Note: Do not turn at the end of the rows. When you do your crochet rows, work from right to left, and when you do your loop rows, work from left to right. Row 1 (Loop Row): Ch 66. Place crochet loop onto knitting needle, *insert hook into next ch, yo, pull yarn through and place loop onto knitting needle, repeat from * to end of row. Row 2 (Crochet Row): Insert hook under first 3 loops on needle, yo and pull through all 3 loops, ch 1, work 3 sc into the group of 3 loops, *3 sc around the next 3 loops, repeat from * to end of row. Row 3 (Loop Row): Place crochet loop onto knitting needle, *insert hook into back loop of next st, yo, pull yarn through and place loop onto knitting needle, repeat from * to end of row. Repeat rows 2 and 3, ending at row 2 until you have reached a desired length. (To make it square, you will need another 17 repeats for a total of 18 loop rows.) Do not fasten off. Rnd 1 (Crochet Rnd): Sc evenly around, working 5 sc sts into the corner st. (This amounts to 64 sts along the sides, plus, 5 sc in corner st, for a total of 276 sts). Join with sl st. Note: The loops of the next round are picked up twice in each st, 1 in the back loop, and 1 in the front loop. Work the back loop first to make it easier to pick up the front loop. This will create the ruffled effect on the edge. Rnd 2 (Loop Rnd): Place crochet loop onto knitting needle, insert hook into front loop of first st, yo, pull yarn through and place loop onto knitting needle, *insert hook into back loop of next st, yo, pull yarn through and place loop onto knitting needle, then insert hook into front loop of next st, yo, pull yarn through and place loop onto knitting needle, repeat from * to end of row. Rnd 3 (Crochet Rnd): Insert hook under first 3 loops on needle, yo and pull through all 3 loops, ch 1, work 3 sc into the group of 3 loops, *3 sc around the next 3 loops, repeat from * to end of rnd, join with sl st. Fasten off.